Vietnamese culture is believed to be one of the oldest in East Asia, but has changed over time due to trade, the French occupation, and influences from neighbouring countries. Vietnamese food has been influenced over the centuries by many different cultures, due to either Vietnam being occupied, or due to the number of other countries it shares borders with, such as Cambodia, Laos and China. However, traditional Vietnamese food is still served everyday to locals and tourists alike. Usually using fresh ingredients, Vietnamese food is more refreshing than other cuisines, and is rated one of the healthiest cuisines in the world. There are several main festivals in Vietnam, including Mid-Autumn Festival and the Ghost festival, but the most important one is Tết, when the whole country is happy, with relatives visiting their home town and gigantic family feasts. There are also religious festivals, where Gods or spirits are worshipped. 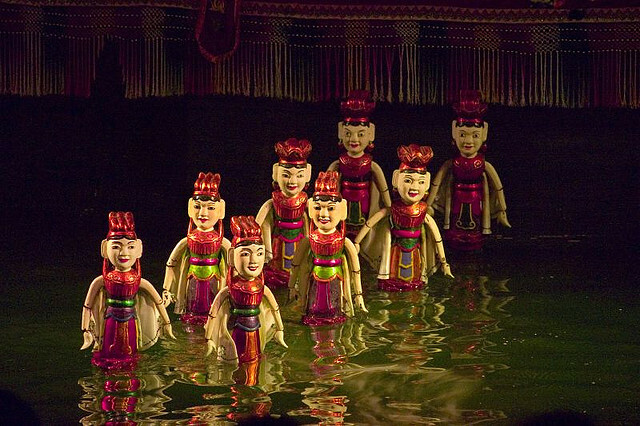 Vietnamese water puppet shows originated in the 11th century in rural villages as a way to satisfy spirits, who the Vietnamese believe control their lives. The original stages for these shows were in ponds or more commonly, rice paddies. As time went on, it gradually changed from a performance for the spirits to a form of entertainment for the inhabitants of the village. The stories told during these plays are normally related to everyday life, to Vietnamese folklore, or to national history. As it was a form of entertainment, a play would normally involve several skits, many of them being humourous. Due to the fact that each scene would have several different puppets, sometimes requiring more than one puppeteer for each puppet, the puppeteers had to practice their synchronicity, especially as they would not be able to see the puppets clearly. Performing troupes and guilds like to keep their manoeuvres secret, and refer to them only by code names. Nowadays, it has transformed into a show for tourists, with lights, live musicians with traditional Vietnamese instruments, a curtain to hide the puppeteers, and even special effects such as smoke, water jets and explosives on the puppets. However, the themes of scenes have stayed pretty much the same and are used by most troupes, including fishing, buffalos, a dragon dance, a boat race, and a fairy/angel dance. Another recurring aspect is the narrator, Teu, a puppet which is meant to resemble a happy farmer. His roles is narrator, commentator, and additional character in some of the humorous skits. At the start of every play, he will come out and give a speech introducing the play. The most famous water puppet theatre in Ho Chi Minh City is the (Rong Vang) Golden Dragon Water Puppet Theatre, located at 55B Nguyen Thi Minh Khai Street, Ben Thanh Ward, District 1, just behind the Reunification Palace, and in front of a tennis club. Shows are everyday at 5:00 PM and 6:30PM. Each show is 50 minutes, with no intermission. May not be suitable for young children due to splashing water, sudden loud noises, and can seem boring because it is a play, and not a children’s cartoon.